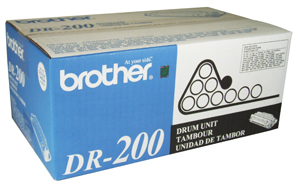 Genuine Brother DR200 Laser Printer Drum Cartridge (20,000 page yield). For printer models HL 700/ 720/ 730+/ 730/ 760/ 760/ 760DX/ 760DX+, IntelliFAX 2550ml/ 2600/ 2750/ 3550/ 3650/ 3750, Fax 8000p/ 8050p/ 8060p/ 8200p/ 8250p, MFC 4300/ 4350/ 4550/ 4550PLUS/ 4600/ 4650/ 6550MC/ 7550/ 7750/ 9050/ 9060/ 9500/ 9550 printers. 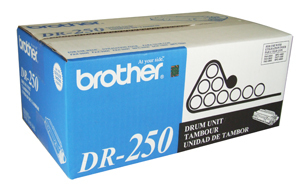 Genuine Brother DR400 Black Drum Cartridge (20,000 page yield). For copier models DCP-1200, 1400; MFC-P2500; Also used for fax models MFC-8300, 8500, 8600, 8700, 9600, 9650, 9700, 9750, 9800, 9850, 9870; HL 1030, 1230, 1240, 1250, 1270n, 1435, 1450, 1470n, P2500, Fax 4750, 5750 , 8350p, 8750p, PPF-4100, 4750, 4750E, 5750, 5750E. 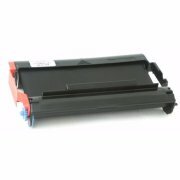 Genuine Brother PC-301 Black Thermal Print Cartridge with Ribbon Refill for the Brother MFC-970MC, PPF-750/ 770/ 775/ 870MC/ 885MC fax machines.